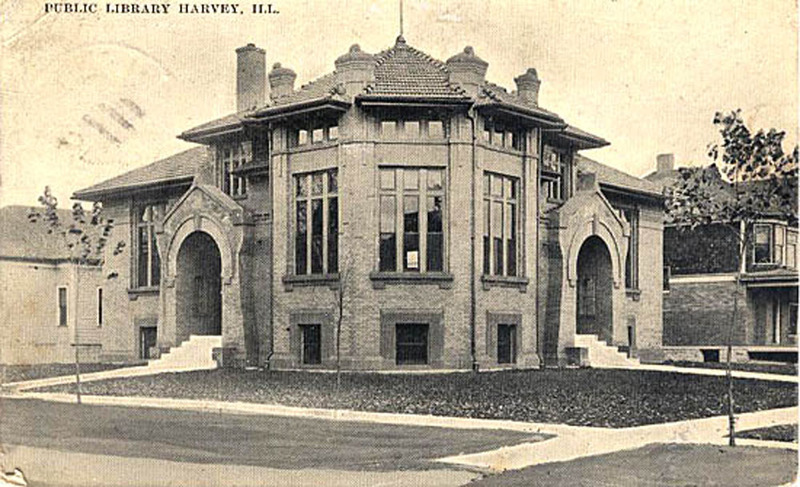 The Library movement in the City of Harvey began in 1898 with the formation of the Harvey Library Association. The organizers of the Association were Professor F.L. Miller, Miss Myrtle Lister, Mrs. C.J. McKee and Miss Georgia Mynard. Subscribers to the service paid twenty-five cents a year and were thereby privileged to borrow one book a week from a collection numbering about 250 volumes. It is thought that the original collection was assembled primarily from individual gifts. The success of the subscription association and the growth of the City led to the passage of an ordinance in 1903 establishing the Harvey Public Library and Reading Room. The ordinance made no direct provision for the construction of a building, but since Andrew Carnegie, the philanthropist steel king, was generously providing the funds for numerous library buildings, an appeal was made to him for assistance. After an exchange of letters between Professor Miller and Mr. Carnegie's secretary, it was agreed that Mr. Carnegie would grant $12,500 for the construction of a building if the City of Harvey would provide the site and stock the structure, when completed. Several sites were considered, but the site at 155th Street and Turlington Avenue was finally purchased with funds from public donations as well as from the City. With the site acquired and construction money assured, the Carnegie interests left it entirely in the hands of the newly appointed Library Board to select the type of building most suitable for the community. A design was selected and actual construction was begun in late 1905. Mr. Carnegie increased his gift to $13,500 and the building was dedicated in May of 1906. Usage of the Library grew as the City increased in population. By the 1960's the population being served was over 30,000, and the concept of a library as a place in which to read or borrow a book had grown to include such services as providing business records, movie film, musical recordings, copying equipment, microfilm references, foreign language recordings and, through membership in the Suburban Library System, access to an almost unlimited supply of material too expensive for local libraries to purchase. By the late 1960's, it became evident that the Carnegie library was too small for the growing community, and since it was impractical to enlarge the existing structure, a new building was designed, erected and dedicated in 1971. The structure quickly became overcrowded, and as finances permitted, additional ground was purchased and plans were prepared for a 1975 enlargement which consists of what is now Youth Services, Director's Office, Reference, the Auditorium and the Story room. On July 1, 1988 the Phoenix Public Library District signed a contract for services with the Harvey Public Library and one year later, July 1, 1989, the Dixmoor Public Library District contracted for the same. In April 1990, the Harvey Public Library petitioned the courts and became the Harvey Public Library District. Previous to this, the Board Trustees were appointed to the positions, and now the public would elect the Library's Board of Trustees. This first election was held in April 1991. In 1906, the initial collection of books numbered approximately 2,500. The staff consisted of one full time librarian, a part time assistant and a janitor. One of the early budgets show a total of four thousands dollars to cover salaries, supplies and books. Today there is a collection of approximately 81,000 books and 4,500 audio visual materials. The Library is staffed by 11 full time and 10 part time employees. In March 1974 the Harvey Library was one of the original libraries to have an on-line circulating checkout system. In July 1992, the Harvey Library District became the first library in the Suburban Library System to connect all of their computers in the building to form a Local Area Network. In November 1993, the Library started using an on-line catalog system (CL-CAT) giving patrons access to the library's card catalog via a computer. January 1997 brought new changes with the introduction of the Internet and it's superhighway of information. Internet access was made available to the public in June of 1997. It should also be mentioned that an impressive group of dedicated citizens have freely given their time to serve on the Board of Trustees and have helped to make this library an outstanding source for education and recreation in the community.